Ohio State head football coach Urban Meyer was placed on paid administrative leave Wednesday, after a bombshell report from Brett McMurphy suggested Meyer knew about the domestic violence allegations against former Ohio State assistant Zach Smith in 2015. Courtney Smith — the ex-wife of Zach who revealed she was physically abused by him — provided Murphy with text messages between the coaches’ wives (including Urban’s wife, Shelley) indicating that Meyer was aware of the abuse, despite what he said at Big Ten Media Days last week. 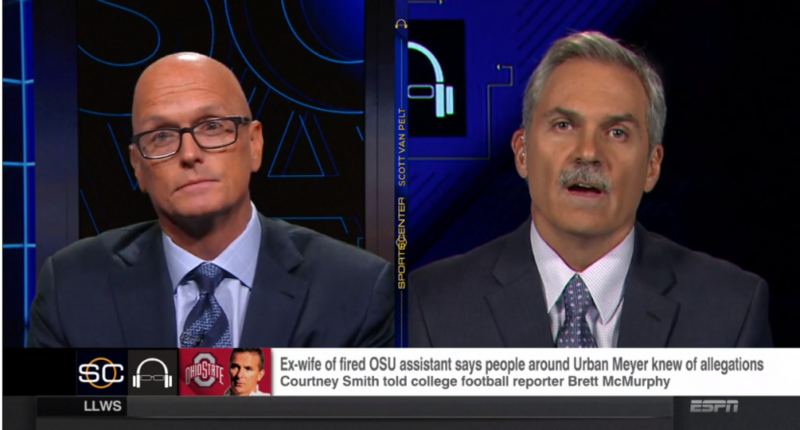 On Wednesday night, McMurphy appeared on SportsCenter with SVP. That’s a big deal, for a couple of reasons. For one, McMurphy was laid off by ESPN last April (something other ESPN employees on radio — including on Wednesday — and television continue to forget). And two, ESPN waited almost four hours to cover the Meyer story on Wednesday, which drew plenty of criticism. It’s hard to disagree with that assessment of the situation; usually these scandals only get worse as more details emerge and more people come forward. Even just shortly after it was announced Meyer was placed on paid administrative leave, sportsbooks had their odds in favor of Meyer being out as head coach. Will @OSUCoachMeyer be fired from @OhioStateFB before Game 1? @betmybookie has posted odds! The odds on Urban Meyer being the head coach at Ohio State have flipped drastically since the announced administrative leave. Ryan Day has been named as Ohio State’s acting head coach. This is despite Greg Schiano — the defensive coordinator and associate head coach — also being on staff. Schiano was the head coach at Rutgers from 2001-2011 and the head coach of the Tampa Bay Buccaneers from 2012-13. Day, 39, is the primary playcaller at Ohio State and was a quarterbacks coach in the NFL before joining the Buckeyes in 2017 (2015 with the Philadelphia Eagles, 2016 with the San Francisco 49ers). If Meyer is indeed done at Ohio State, it will be interesting to see if Day remains the head coach, or if the school looks for a high-profile answer outside the program (if they don’t just go to Schiano instead, of course). While this scandal would obviously be a horrible look for the program, Ohio State would likely remain a highly coveted head coaching job. Bovada currently gives the Buckeyes the third-best odds to win the national championship.